Wearing black motorcycle leathers and carrying a helmet, Stefanie Brendl strides into a pastel-themed Waikiki hotel, looking out of place. She has spent years doing what terrifies many beachgoers and visitors to the islands: diving with sharks. 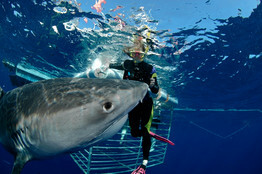 STEFANIE BRENDL free-dives alongside a tiger shark about 3 miles off the North Shore of Oahu. Sharks can be very shy, she says. They tend to gather at that spot because of the crab traps there. Ms. Brendl is the owner of a small company called Hawaii Shark Encounters, on Oahu’s rough north shore. Weather permitting, she takes customers on her boat just after dawn about 3 miles off shore, in waters known for huge swells and fierce storms. Once there, the group usually encounters Galapagos and Sandbar sharks, which are curious about humans but generally not aggressive toward them. Sometimes they’ll meet a Galeocerdo cuvier, commonly known as a tiger shark, one of the most terrifying predators on the planet. Ms. Brendl began observing tiger sharks closely just over a decade ago, from inside the protective metal cage she uses for her shark-diving tours. Then she ventured where few choose to go: Gradually, through weeks and months of repetition, she worked up the confidence to leave the cage and swim alongside the sharks. Over time, “I began to understand their behavior, and by approaching them calmly, they began to accept me into their world,” she says. With blunt heads and striped, tigerlike markings, the sharks can grow up to 18 feet long. She vividly recalls the first time that she touched a female tiger shark, feeling its gray, sandpaperlike skin and well-defined muscles. She also remembers her own clear sense of connection with the shark after putting her arm over its back. Ms. Brendl—with a female tiger shark, here—has been diving for decades. She encountered her first shark in Palau in 1987 and her first great white shark in the waters off Mexico. Researchers have recently discovered that great whites migrate from the U.S. West Coast to Hawaii. The shark-diving business was the dream of her late partner Jimmy Hall, an extreme-sports enthusiast. Together, they started the business in 2002 in the former North Shore plantation town of Haleiwa. Mr. Hall died during a base-jumping expedition to Baffin Island in 2007. After his death, Ms. Brendl took over the business. 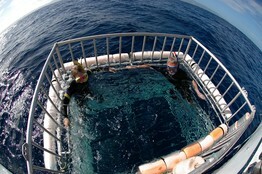 For $105 apiece, visitors climb aboard Ms. Brendl’s boat, head offshore and climb into a cage in the water, wearing snorkel equipment to observe these predators up close. A few years ago, it struck her that just having fun as a diver wasn’t enough. She wanted to find a greater purpose for her years of firsthand study of the behavior of sharks. After a free dive in deep blue waters that brought her eye-to-eye with a tiger shark, she got the distinct feeling that “the shark had called me out.” Today, part of Ms. Brendl’s goal is to use each trip as a way to educate her guests about the plight of sharks, whose numbers are declining. John McCosker, chairman of aquatic biology at the California Academy of Sciences, estimates that 90% of the sharks that once inhabited the world’s oceans have now disappeared, due to overfishing and shark finning—a practice in which sharks are captured and their fins are sliced off for use in shark-fin soup. The sharks are then dumped back in the ocean and left to die. To educate people about sharks, Ms. Brendl started a group called Shark Allies. She was also one of the principal activists who spearheaded Hawaii’s landmark 2010 bill banning the possession, sale, trade or distribution of shark fins. “Her testimony was riveting because of her knowledge of sharks,” says Hawaii Sen. Clayton Hee, who worked closely with Ms. Brendl in passing the state’s ban. He has continued to work with her on the issue in Guam, Palau and San Francisco—each of which has since passed laws banning shark finning. “There’s a bright line of success that is directly attributable to Stefanie Brendl,” he says. Because of her preference for animals over people, she wasn’t initially drawn to the tour business. But now she says it is the most important way she knows to educate more people about sharks. Many of the people who sign up for her tours are terrified of sharks—and very few have encountered one out in the wild. Ms. Brendl has found that the human behavior is the biggest challenge she faces in offering her tours: The cage is there “to keep things in order,” she says. A version of this article appeared April 27, 2013, on page C11 in the U.S. edition of The Wall Street Journal, with the headline: To Swim With the Sharks.